Lenders look at a borrower's credit score, number of open accounts, payment history, type of credit borrowed and a series of other factors when determining what level of risk to assess to each lending scenario. A credit score is primarily based on a statistical analysis of a person's credit report information, typically from the three major American credit bureaus: Equifax, Experian, and TransUnion. In the United States, a resident is permitted by law to view their credit report once a year at no charge by visiting the website AnnualCreditReport.com. 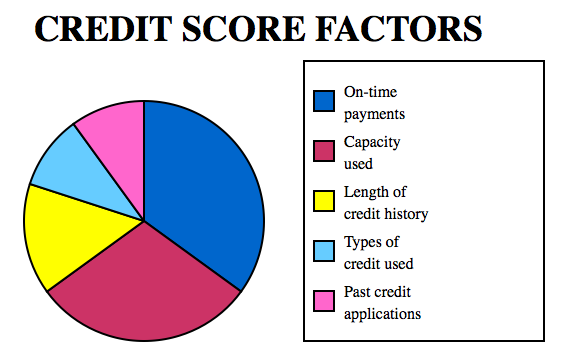 The individual's â€œcredit scoreâ€� information is available for an additional fee from each of the three credit reporting agencies. In addition, the Fair Isaac Corporation sells FICO scores directly to consumers using data from Equifax and TransUnion. By following these guidelines over an extended period of time, credit scores can be maintained and improved in order to improve the borrower's loan potential and interest rate.